The wait is over! And after much consideration, The Nocturnal Times presents our picks for Top Electronic/Dance Albums of 2016. This year’s Top 16 Electronic/Dance Albums, according to The Nocturnal Times, is here! An eclectic assortment of electronic albums across a variety of sub-genres, whether you fancy trance, house (deep, progressive, future, tech, electro), techno, bass, nu-disco, big room, trap, and more. Blurring the genre lines and appreciating good music, our top picks are those among more than 100 considered electronic album releases this year. Some electronic music veterans returned this year with full-length studio albums, while some emerging talent made noteworthy first impressions with stellar debut LPs. This year, like every year, we’ve reviewed them all. Find out which albums were selected by The Nocturnal Times editorial team as the Best Electronic/Dance Albums of the year. Gareth Emery’s “100 Reasons To Live” is the third studio album release from the Garuda Music powerhouse. The album’s first single, “Reckless” feat. Wayward Daughter, went on to be one of the biggest dance releases of 2016. Following the release of one of the top albums of the year, after “100 Reasons To Live” was released through Garuda in April, Emery released a remixed rendition. “1000 Reasons To Live” includes remixes from John O’Callaghan, Ferry Corsten, Ashely Wallbridge, David Gravell, Capa, and Ben Nicky, among many others. Additional single releases from “100 Reasons To Live” include “Save Me” feat. Christina Novelli, “Lost” feat. Janet Devlin, “CVNT5” with Ashley Wallbridge, “Hands” with Alastor feat. London Thor, and “When We Were Young” feat. Alex & Sierra. Read our interview with Gareth Emery from earlier this year. The debut album, “Generationwhy,” from the Chinese-American DJ/producer, Steven Zhu, was released in July through Columbia Records. ZHU exploded onto the scene with his singles “Faded” and “Automatic” feat. AlunaGeorge, which preceded his debut LP. “Generationwhy” includes the masterful creations: “In The Morning,” which was re-released alongside Kaskade; “Palm Of My Hand;” “Working For It” with Skrillex and THEY; “Hometown Girl;” and the title track, “Generationwhy,” which was released in October with a short-film music video. The simply stated “Bloom“ was released on January 22, 2016 and managed to hold on to a stake in The Nocturnal Times Top 10 Albums of 2016. The album is chalk full with instant classics like “Say A Prayer,” “You Were Right” and the remix-pack worthy “Like An Animal.” They’ve proved to be a cool refresher of the typical “electronic” based artists, and if you were lucky enough you might’ve got to catch them live during their lengthy US tour. This album is a must hear of 2016 and something generally applicable to a wider fan base for those who just enjoy good music. This November release from Justice caused an uproar among electronic enthusiasts who were anticipating the LP for years. “Woman” is the follow-up to their 2011 studio album, “Audio, Video, Disco.” Nu-disco and funk, the 10-track “Woman” features “Safe and Sound,” “Randy” feat. Morgan Phalen of Diamond Nights, “Fire” feat. M. Yaman and “Alakazam !” Gaspard Augé and Xavier de Rosnay released their-highly anticipated “Woman” album through Ed Banger Records/Because Music on Nov. 18th to critical acclaim. It’s easy to see why the third artist album from the famed French electronic duo is among our must-hear selections of the year. Fans and critics alike conquer: Justice is back and better than ever! All hail the king of dance music: Eric Prydz! Electronic music lovers rejoiced (and are still rejoicing) over the debut album from Eric Prydz, “Opus.” If you needed a few more reasons to just now become a fan of Eric Prydz, we’ve got some: “Every Day,” “Liberate,” “Generate,” “Opus,” and “Breathe” feat. Rob Swire. EPIC—Eric Prydz In Concert, presented by Eric Prydz—is an innovative experience provided by the Swedish producer and DJ. Last year, Eric brought EPIC 4.0, with his notorious cube, to various venues across the globe, which delivered a mind-blowing visual experience for all those in attendance. Prydz has recently announced that he will premiere his EPIC 5.0 in May 2017. The sixth studio album from Markus Schulz, “Watch The World,” was a hit among trance fans and critics alike. Full of vocal productions and collaborations, Schulz partners with Kyau & Albert on “Fears,” and the album’s singles “Destiny” feat. Delacey, “Love Me Like You Never Did” feat. Ethan Thompson, “Facedown” feat. Soundland, and “You and I” feat. Adina Butar. The Deluxe Edition of “Watch The World” includes acoustic renditions of the album’s tracks, which include: “In The Night” feat. Brooke Tomlinson, “I Hear You Calling” feat. CAYO, “Let It Rain” feat. Helen, “Summer Dream” feat. Mia Koo, and “Watch The World” feat. Lady V. Find out what Markus had to say about his year when we caught up with him at EDC Orlando in November; read our full interview with Markus Schulz. Underworld makes a giant statement with their 2016 LP, “Barbara, Barbara, We Face A Shining Future,” which includes only seven tracks. The ninth studio album from the British conglomerate was released in March. The latest of the album’s single releases, “Nylon Strung,” is among our Top Electronic Tracks of 2016. The group also released tracks one and two from the album as singles, “I Exhale” and “If Rah,” respectively. Dance music veterans, Underworld, have not released an album since their “Barking” album in 2010. As one of the first album releases of the year, it was still next to impossible to forget the impact of Steve Angello’s debut artist album. Not fixated around one sound or genre, Angello’s “Wild Youth” touches on progressive, dubstep, bass, indie, rock, pop, ambient, and other experimental sounds. The former Swedish House Mafia member released the singles “Wasted Love” feat. Dougy, “Children Of The Wild” feat. Mako, “Prisoner” feat. Gary Go, “Tiger,” “The Ocean” with Saturday, Monday feat. Julia Spada, and “Remember” feat. The Presets. The album closes with a spoken word track from Angello, where he talks about his life growing up in Stockholm, Sweden. Just ahead of the heart of the US festival season, the young Australian prodigy dropped his sophomore album “Skin.” It rose to #1 on charts internationally including the US Dance/Electronic Albums on Billboard, and holding a #8 overall position in the US Billboard 200. It’s easy to see why “Skin” was so well received. He starts the 16-track album with “Helix,” one of the year’s finest introduction tracks. “Skin” contains future bass vocal anthems like “Never Be Like You,” “Say It,” and “Smoke & Retribution.” You can also find a magnificent gem of an ambient track in “When Everything Was New.” The album is still very well alive today, as a five-pack remix release of “Say It” by Clean Bandit, Anna Lunoe, SG Lewis, and Stwo came out November 4. William Sami Etienne Grigahcine, better known as internationally acclaimed, Grammy Award-nominated producer, DJ Snake, released his debut studio album, “Encore,” in August via Interscope Records. The LP debuted at number 8 on the US Billboard 200 albums chart and earned nearly 17 million streams in its first week. The 14-track encore includes notable collaborations with dance music great, Skrillex (“Sahara”); Yellow Claw (“Ocho Cinco”); Jeremih, Young Thug, and Swizz Beatz (“The Half”); Mr. Hudson (“Here Comes The Night”); and Travis Scott (“Oh Me Oh My”). “Encore” also boasts the popular single releases “Middle” feat. Bipolar Sunshine; “Talk” feat. George Maple; and the wildly-successful radio-smash, “Let Me Love You” feat. Justin Bieber. Some would be surprised to know that “Good Times Ahead” was the first GTA full-length studio album and had the backing of Warner Bros. Records to go alongside it. The duo from Miami have built themselves a name with energetic originals such as “Red Lips” and the Diplo collab “Boy Oh Boy.” Expectations were high for the debut album “Good Times Ahead,” and from the very first track of “True Romance,” you knew you were in for a ride. With a full-length album capturing and meshing so many different sounds from GTA, their risk was rewarded with one of the most solid productions to come out of 2016. If you would put Anjunadeep roots and London-based production together you instantly get a match made for house music heaven. Dusky first popped on the scene with the Anjunadeep album in 2011 “Stick By This.” Their second album “Outer“ dropped in mid-October going up with most the year’s greatest release, but instantly pleaded a case with gurn-worthy hard hitting tracks such as “Sort It Out Sharon” alone. They play you into the album with the progressive tunes “All We Ever Needed” and “Tiers,” before taking you everywhere from London afterhours to the self-meditating “Marble.” A shockingly cultivated production from Dusky makes it a top album of 2016. The debut album from Alle Farben, “Music Is My Best Friend,” saw its release through Synesthesia Recordings/Guesstimate. The 14-track LP includes the popular singles “Bad Ideas,” “No Ordinary,” and “Please Tell Me,” which have garnered more than 50 million streams on Spotify alone, respectively. Frans Zimmer, better known by his stage name, Alle Farben, made waves with his debut studio album, “Synesthesia,” which was released in 2014, and has been crafting beautiful tunes ever since. The album, “Music Is My Best Friend” is eclectic and diverse, such as the artist that created it. Serving up hints of deep house, electro, trance, pop, rock, techno, tech, bass, and indie, Alle Farben’s “Music Is My Best Friend” covers all bases; offering something for everyone—even the pickiest of listeners. Quite a few titles earned honorable mention in the Top Electronic/Dance Albums of 2016 including the third studio album from Alex M.O.R.P.H., “Not All Superheroes Wear Capes” [Vandit Records]; Mat Zo “Self Assemble” [Mad Zoo], which is the follow-up to Zo’s 2013 Grammy Award-nominated “Damage Control” [Anjunabeats]; Bassnectar “Unlimited” [Amorphous Music]; the debut album from Lost Frequencies, “Less Is More” [Ultra Music/Armada Music]; Miike Snow “iii” [Downtown/Atlantic Records]; Cash Cash “Blood, Sweat & 3 Years” [Big Beat Records/Atlantic Records]; Black Coffee “Pieces Of Me” [Ultra Records]; GRiZ “Good Will Prevail” [All Good Music]; Justin Martin “Hello Clouds” [Dirtybird]; King Arthur “Believe In The Kingdom” [HEXAGON/Spinnin’ Records]; Rodg “High On Life” [Statement! Recordings/Armada Music]; Big Gigantic “Brighter Future” [Big Gigantic Records]; Tritonal “Painting With Dreams” [Enhanced Music]; Adventure Club “Red // Blue” [Ultra Records]; Zeds Dead “Northern Lights” [Deadbeats]; and Sean Tyas “Degeneration” [Black Hole Recordings]. 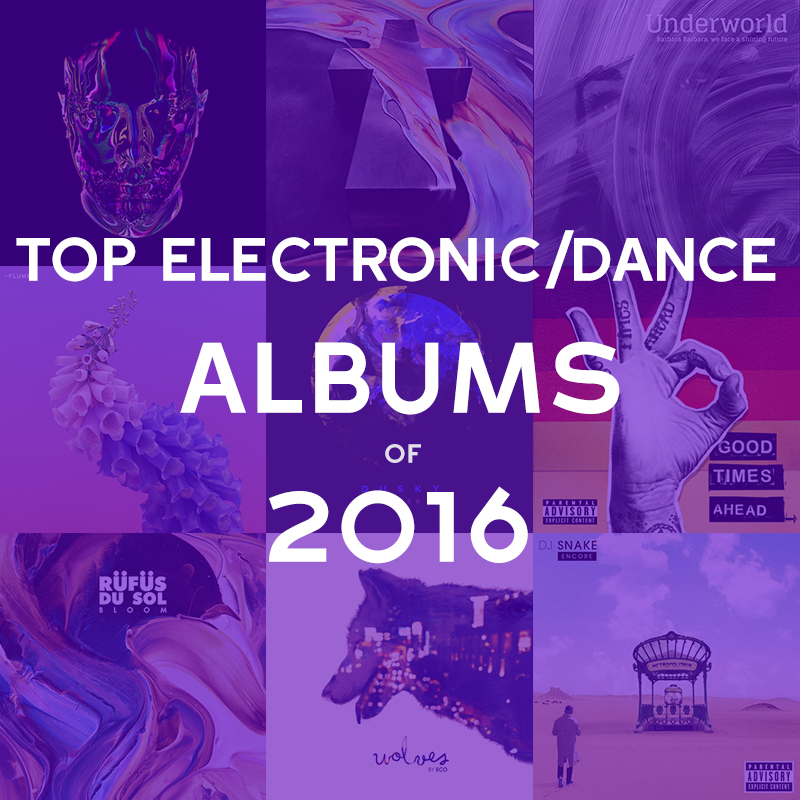 *The Nocturnal Times Editors have taken full-length LPs into account for the results of the Top 16 Electronic/Dance Albums of 2016. EPs, remix albums, compilations, singles, mixes, radio shows, podcasts, and mixtape’s have been considered in other chart categories.